Recently, Jared Spool caught my attention with an article about how Netflix’s performance engineers are actually designers. It’s a provocative idea, but it makes sense. His argument is that everyone in your organization (including performance engineers) designs the product, not just the people with “design” in their job titles. From some of the reactions, you might think Jared had kidnapped a baby for ritual sacrifice. What exactly did Jared write? The members of this team are performance engineers. They are architecting, engineering, and maintaining the performance of a very complex system. It occupies all their time and then some. In systems engineering, there are few jobs more technical than these. And yet, at the very moment that a Netflix viewer’s video stream stops and that spinning animation appears, indicating the player is now awaiting more data, these engineers make a dramatic change. They become user experience designers. I made that last sentence bold — because it’s really important. Some designers are uncomfortable with the idea that an engineer or a salesperson or a CFO could be a designer. This shouldn’t be provocative — it’s just a statement of fact. I work with dozens of startups every year, and I see it happen at every one. A CFO makes a pricing decision and changes the product experience. An engineer makes a performance trade-off. A salesperson writes a script for talking to customers. In my view, people who fundamentally change the customer’s experience are designers. If this is so self-evident, why do Jared and I press the point? I keep beating the drum because I want designers to change the way they think about their role and become better stewards of good design. For a moment, consider how this shift in perspective could change the way you work. When you accept the reality that design decisions are coming from outside your group, by people without “design” in their job titles, you approach your co-workers differently . Now they’re not just your co-workers — they’re your design team. The solution [at Airbnb] actually deemphasizes the designers. The point… isn’t to create a “design-led culture,” because that tends to tell anyone who isn’t a designer that their insights take a backseat. It puts the entire organization in the position of having to react to one privileged point of view. Instead, Schleifer wants more people to appreciate what typically lies only within the realm of designers — the user viewpoint. Does everyone need all the skills of a designer? Of course not. But each person needs to be armed with the tools to understand how their decisions affect the customer experience. One of the best ways to encourage empathy is to watch customer research studies with co-workers from across your company. When my colleague Michael Margolis runs a study with a GV company, we insist that the real team — not just the designers — watch those interviews and take notes. If it’s not possible for everyone to watch in real time, you can record the sessions and schedule a “viewing party” for later. When you accept that design happens almost everywhere in your organization, you have to take responsibility for it. Your app is slow? Go sit with your engineering team. Your marketing team is poorly communicating your product to future customers? You’d better offer to work with them on the problem. Yes, doing design with everyone at your company is a lot of work. But it’s necessary if you want to be a truly great designer — otherwise, you’re simply papering over bad decisions. For example, imagine that your CEO created a complex pricing structure for your product. You could focus on making the pricing page as clear as possible using your interface and information design skills. But the harder and more important design opportunity is to work with your CEO on repricing your product so it’s clear to customers and compatible with the business goals. Focusing on the core business is what differentiates real product design from interface design or even user experience design. Fundamental product design is really hard and requires a lot of legwork, but this is what designers at the highest level do — and it’s why their work is better than yours. Design is a hard job. 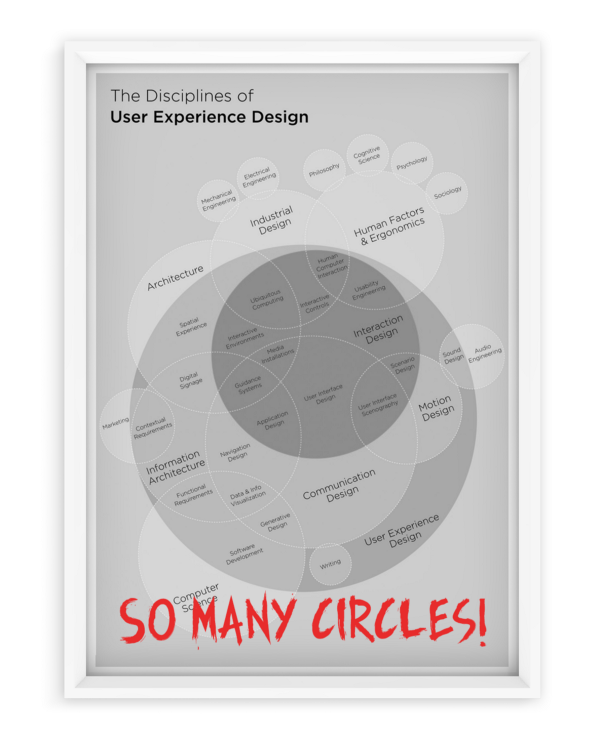 You’ll need a wide range of skills (look at all of those circles in thediagram of UX Disciplines by Dan Saffer) and years of practice to truly master design. Maybe that’s why so many designers are offended when non-designers do design work or get called “designers” by Jared and me. You can act offended if you want, but the reality is that other people are making design decisions with or without you. Embrace them . They don’t make your job less valuable. They don’t make your job title less meaningful. Having more people who do design is additive, not competitive. These designers make your team and your product stronger, because they’re contributing from their unique perspectives. Help them bolster their skills, and use their expertise to the advantage of your product and company. My heart sank. The design team was just down the hall from this executive, but they didn’t work together. Instead, the designers sat behind soundproof glass walls and did special “creative work” in isolation. This executive made decisions every day that affected her customers. She bears some of the blame for not reaching out to the designers “in there.” But the design team is primarily at fault — for missing an opportunity to reach out and work together on some of the business’s most important challenges. via Everyone is a designer. Get over it. – GV Library.